Watch this video and learn why SUNRAYS are the number one selling warm water bootie in Bonaire and Hawaii. The HALF TOP 3 mm SUNRAYS are the most unique diving bootie for warm water travel because they are actually "tennis shoes" or "sneakers". In other words they are athletic footwear. This means they have an elevated heel and orthotics. This provides the wearer with balance, stability, and kinetic harmony while walking, moving and swimming. Divers wear a lot of weight, a filled aluminum 80 weighs 38 lbs. alone and it seems silly if not outright dangerous to be wearing footwear that could be described as a bedroom slipper. 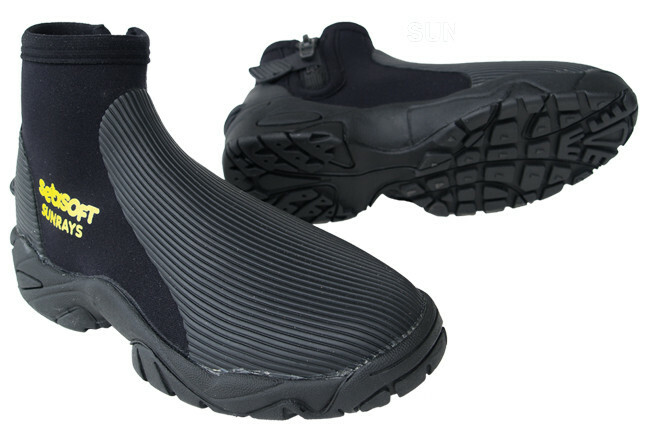 SEASOFT's SUNRAYS are not bedroom slippers but serious footwear for in and out of the water. Don't cheat yourself by wearing bedroom slippers, get the real thing, athletic footwear! Why should you buy these SEASOFT SUNRAY Booties?